East of Capitol Reef on Route 24, the chalky landscape begins to take on random shapes. Large mudhills sit lonely and misshapen among the rolling Cainville Badlands. In places the earth is dry and cracked. To the north, Factory Butte rises up from flat surroundings. With an outwardly sloped bottom and gouged sides, her horizontal headdress interrupted only by a slight upturn, she towers regally. Ahead the road juts north as it passes Hanksville’s Hollow Mountain Store. Ice cold drinks, maps, snacks, T-shirts, bait and beer – all for purchase in a single store carved into the side of a sandstone mound. Interstate 70 swallows Route 24, turning east and crossing Green River before handing me to Route 191 dropping south. Dipping toward Moab, against a backdrop of burnt stone walls, telephone lines mirror every turn, every change in elevation – an unbroken line of wire. Roadside dinosaurs stand in open fields. T-Rex striking a menacing pose, Stegosaurus spike backed and lumbering. Near the bottom of Moab Canyon, the road into the park begins a steep climb. Canyon walls hold the road to the north, as the south precipitously falls away. Switchbacks lead skyward. Up onto the flat plain and looming Courthouse Towers. Up into the home of balanced rocks and graceful arches. According to the Arches National Park visitor’s guide, when hiking the three miles to Delicate Arch, “Take at least two quarts of water per person. There is no shade and some exposure to heights. Elevation change is 480 feet.” I found this to be helpful, but wouldn’t dream of hiking only three miles with two quarts of water. Unless you fall off a ledge and become stranded for a couple of days, two quarts of water seems a bit much. I’m also convinced that a camel is lurking in my family’s DNA, so I require less water while hiking. (If you do not have a camel in your illustrious family history, please adhere to park guidelines.) As for the elevation gain, 480 feet doesn’t sound like much, but it is completely dependent on how fast you acquire the elevation. 480 feet in a half mile is essentially straight up. Over 1.5 miles it would be considered moderate. The dilemma is in not knowing until you hit the trail, or read reviews – And let’s just say I sometimes have a rather lax approach to reading reviews. As it turns out, the hike to Delicate Arch was more of a steady climb, with a few instances where steep would be a better descriptor. At one point the trail broadens and crosses a field of pitted slick-rock, before returning to a series of turns on a narrower rock strewn trail. Near the top, perhaps the last 200 yards, the trail becomes a ledge with steep drops to my left. It was early in the day and where sun hadn’t hit, the ledge had spots of ice – just enough to make you pay close attention to each step. (I didn’t have enough water for a fall.) As you round the last turn and the arch suddenly comes into view, I am amazed by its height and width. It appears large even from a distance across the deep chasm that rests in front. There is one person standing beneath the arch and the juxtaposition reinforces the dimensions. It is a large, free-standing sandstone arch that has miraculously survived. Delicate Arch with La Sal Mountains in the background. The La Sal’s are like ever present high definition wallpaper throughout the park. Delicate Arch from the back. There is a reason you don’t see many shots from this angle. Once you venture down the sandstone, let’s just say it is difficult to climb back up and leave it at that. No need to embarrass myself any further. On this morning there are only a few scattered people near the arch. Everyone wants their photo taken under the arch, but it’s difficult to get the entire arch into frame unless you are either far away – in which case the people in the shot appear small – or lay down on your back in order to get the height of the arch and a closer view of the people in the shot. So on my back I go, snapping several for a pair of couples. Then a family of one man, four dress wearing women and 9 children arrive at the arch. (One word – Utah.) The gentleman asked if I would mind taking their photo. When the happy family held hands, they could touch both sides of the arch. They did not break into song, but it was impressive none-the-less. I asked them to email me a copy, but it has yet to arrive. Perhaps they are on a nationwide tour – holding hands at various landmarks. On the way back down I met the Hawthorn family – a mom and her two daughters. Doing what I do, I am fortunate to meet people from around the world and all walks of life. Typically there is an instant sense of common ground, simply because you are at the same park, obviously sharing a similar experience. Occasionally, it exceeds those boundaries and you find that beyond the present experience, you share something that touches another part of your life. In this case it was baseball. For those who know me, this does not come as a surprise. Baseball is a religion, a higher calling. The most beautifully constructed game in history. Poetic movement, athletic grace and a continuum that allows measurement since the game’s origin. It is precise, yet flawed in its execution. In theory, it is endless. The two young girls were opposites. One was chatty, while the other remained silent. Mom struck me as the perfect amalgamation of her daughters. We talked about the hike to Delicate Arch, which they were only beginning, and how difficult it might be for mom, who had a large leg brace as the result of an ACL injury while skiing in their home state of Colorado. My advice – don’t even think about climbing without two quarts of water each and the climb will be difficult in sections with the brace. They had wonderful stories about national parks, hikes and being outdoors. I explained TheMountCo Project and was assured that by the end of the day I would have three new followers on Instagram (I got one and was thrilled). Then I mentioned baseball. I think it was in the context of skiing, being athletic and bragging about my son P who plays baseball at Capital (GO CAP!). “My mom was a star softball player,” said the older girl. “She played in college and was a star.” Is that so? “I was pretty good,” said mom. How good? “Pretty good”, with a smile. We talked for a while longer about a few hikes in Arches that they had already taken, then said goodbye. I finished my hike down to the trail-head, thinking that I had met a wonderful family. One that appreciated nature and understood how it touches the soul. And they loved baseball. Perhaps they will adopt me. Arches National Park contains over 2,000 arches – the greatest concentration in the United States. 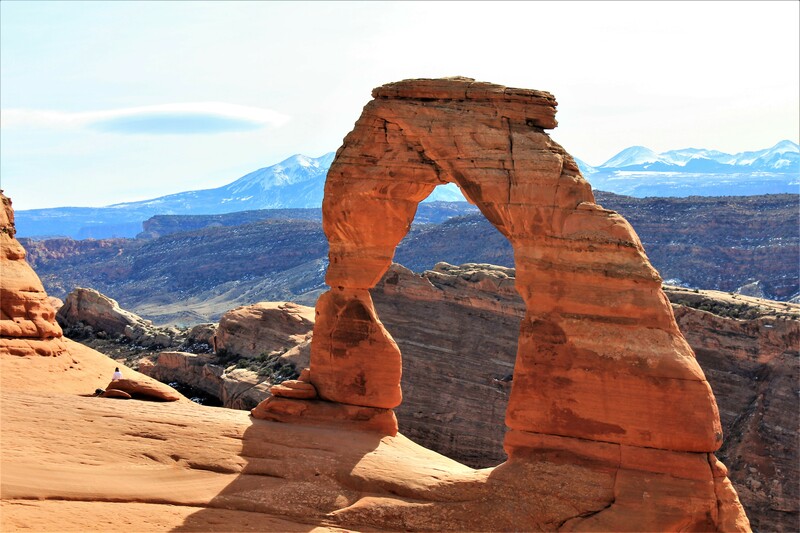 But as with several other national parks primarily known for one geological feature, Arches is a diverse landscape. Oddly shaped rocks balanced on a few feet of red sandstone. Burnt orange pinnacles and spires springing from the earth, randomly reaching skyward, layered and weatherbeaten. Domes of khaki slickrock sit in ageless repose, while sandstone fins gaze down at salt flats deposited in the Paradox Basin of the Colorado Plateau some 300 million years ago. Arches is a fragile high desert ecosystem masquerading as a sandstone palace. A land of color and dimension being erased with each gentle wisp of the wind. Arches version of hoodoos. Shorter and beefier than Bryce Canyon. Teetering rocks are found throughout the park. Nature’s version of Jenga. Devils Garden Trailhead sits near the northern edge of the park and leads to several arches. Tunnel Arch and Pine Tree Arch are a short walk. Landscape Arch is about a mile further, along a relatively even trail that eventually climbs to a stunning view of the high skinny arch. At 306 feet long, one of the world’s longest freestanding natural arches, Landscape Arch contradicts gravity. Fatally seamed and water striped, it stubbornly reaches across a boulder strewn and juniper bush littered rise. Due to several rockfall events in the 1990’s, the trail beneath the arch is closed. After marveling at its delicate beauty, my next thought was this will not be here in 200 or 20 years. I hope I’m mistaken. Landscape Arch against a brooding sky. Then, in the words of the visitor’s guide, “The trail beyond Landscape Arch becomes difficult, with rock scrambling, narrow ledges and exposure to heights.” It turned out to be an accurate description of the trail to Navaho Arch. The initial leg of the ‘rock scrambling’ is a rather steep grade. You have to lean into the rock, sometimes using your hands to steady yourself for the next step. This while the sides of the rock fall away – down onto rocks far below. When you think you’ve reached the top you haven’t. More scrambling, this time between boulders, leads you further upward until you reach a high narrow spine of stone. At the end of the spine the trail swerves, before droping you onto a plateau of boulders, juniper and shrub. A narrow stone ledge near the top of the rock scramble leading to Navajo and Partition Arch. A portion of the rock scramble near the top. You can see someone coming up the trail – he’s the little green dot at the bottom. The high plateau trail to Navajo twists through large boulders, across cairn marked sliprock, ducking under craggy overhangs and over downed pinyon pines. The ever present La Sal Mountains hover on the horizon, snowcapped, reflecting the late afternoon sun. Since climbing the rocks I have not encountered another hiker, but I can hear voices bouncing on stone, carried on the high wind. Navaho Arch, is carved tunnel-like into purple hued Entrada sandstone, its bulk guarded by leaning junipers. As I walk into the sandy opening, wind funnels through and heavy branches rustle – a smooth low pitched movement. I like this arch – it has bulk and depth. Sitting on a pinkish gnarled log, I wondered how many post Ice Age hunters took shelter here. How many Puebloans, Utes and Paiute built fires in her belly before the first Europeans arrived? I can not conjure answers to her past. I can not foresee her future. But my hope is that one day, countless generations forward, young people will still be able to sit in this exact spot and ponder the same questions. South Window Arch as the sun was setting – apparently lighting this person on fire. Driving back to camp one evening, the skies put on a dazzling display over Willow Flats. Evening skies turned rock a shade of violet and the mountains blue. Sand Dune Arch. Add a pool and a cool drink and you could imagine you were at the beach. I see an ice cream cone. A carrot of snow sending out shockwaves. A topographical map looking down on Everest. Quiz – what is the name of the mountains in the background? A short, narrow canyon filled with eroded sand. I took off my boots and it was soft, fine sand – cool to the touch. This is a panhandler who attempted to grab my camera. I almost numchucked him. NOTE: For more information on Arches National Park and all the National Parks and to help with trip planning, download the free Chimani app to your smart phone to easily navigate your way around the park, with or without cell phone service.